President Donald Trump has endorsed this notion as well, promising that the U.S. will have “the cleanest air” and “the cleanest water” even in his speechthis month repudiating the Paris climate agreement. Pruitt has labeled this vision “EPA originalism,” in a nod to someconservatives’ long-running arguments that judges should interpret the Constitution as the Founders understood it. But several former EPA chiefs say Pruitt and Trump have it wrong — and that the agency’s mission was never as narrow as the current administration wants it to be. Pruitt has also defended Trump’s proposal for a 31 percent budget cut at his agency in fiscal year 2018, which would force it to shed about a fifth of its workforce — saying EPA’s core functions would survive. “I believe we can fulfill the mission of our agency with a trimmed budget, with proper leadership and management,” he said at an appropriations hearing that had him fielding complaints from Republicans and Democrats alike. On the other hand, Trump’s proposal would slash many of the same toxic-waste and clean-water programs that Pruitt has put at the center of the agency’s mission. Pruitt has also placed a greater emphasis on considering economic concerns in the agency’s decisions. He has cited that reasoning when he has rolled back regulations on climate change, air pollution and clean water, even in cases where the Supreme Court has said costs cannot factor into a regulation. That means Pruitt cannot act like a “tinhorn dictator” by deciding which laws to avoid “in favor of economic development,” said Thomas Jorling, a former Senate Republican staffer who co-authored the Clean Air Act in 1970 and the Clean Water Act in 1972. Jorling, who filed a court brief last year defending the Obama EPA’s landmark climate regulation, accused Pruitt of being “disingenuous” by focusing the agency on a limited set of priorities. “There’s a lot more uncertainty around [global warming], but that doesn’t mean you don’t deal with it,” he said. Instead, Pruitt aims to focus on the Superfund program, cleanups of polluted “brownfields,” and drinking water infrastructure, all of which involve economic development. He has also placed an emphasis on implementing last year’s bipartisan chemical safety reforms, especially the process that approves new chemicals for use in products. 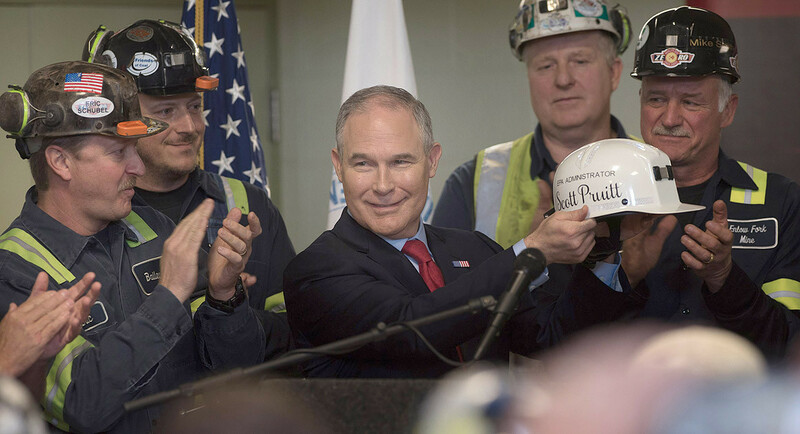 “It seems to me EPA has fairly clear statutory responsibilities under a number of statutes, and those statutory responsibilities should come first,” said Ebell, director of the Competitive Enterprise Institute’s Center for Energy and the Environment. For example, the Clean Air Act includes a catch-all provision, Section 111, that allowed the agency to address newly discovered pollutants not covered elsewhere in the law. EPA had used that provision just five times over the decades, mostly on obscure pollutants, before the Obama administration wielded it to target carbon dioxide from power plants. Gina McCarthy, Pruitt’s immediate predecessor as EPA administrator, said it’s “crazy” to believe that the agency’s role was not intended to evolve to include new problems like climate change.